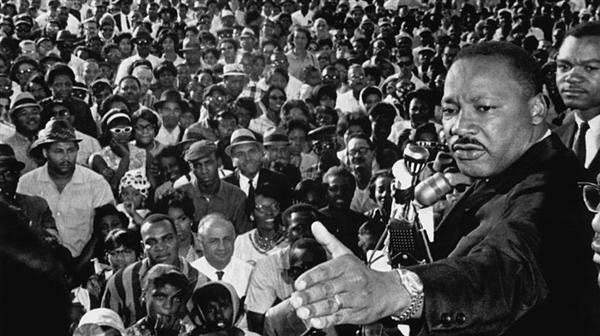 Ten quotes from Dr. Martin Luther King, Jr.
1. He who passively accepts evil is as much involved in it as he who helps to perpetrate it. -- "Stride Toward Freedom," 1958. 2. The ultimate measure of a man is not where he stands in moments of comfort and convenience, but where he stands at times of challenge and controversy. -- "Strength to Love," 1963. 3. Injustice anywhere is a threat to justice everywhere. -- "Letter from Birmingham Jail," April 16, 1963. 4. Nothing in the world is more dangerous than sincere ignorance and conscientious stupidity. -- "Strength to Love," 1963. 5. Freedom is never voluntarily given by the oppressor. -- "Letter from Birmingham Jail," April 16, 1963. 6. The means by which we live have outdistanced the ends for which we live. Our scientific power has outrun our spiritual power. We have guided missiles and misguided men. -- "Strength to Love," 1963. 7. Nonviolent direct action seeks to create such a crisis and foster such a tension that a community which has constantly refused to negotiate is forced to confront the issue. -- "Letter from Birmingham Jail," April 16, 1963. 9. Nonviolence is a powerful and just weapon. It is a weapon unique in history, which cuts without wounding and ennobles the man who wields it. It is a sword that heals. -- "Why We Can't Wait," 1964.